Xiaomi MIUI Official Forum › Devices › Mi Gadgets › Mi Electric Scooter Wins "Best of the Best" Red Dot Award 2017! 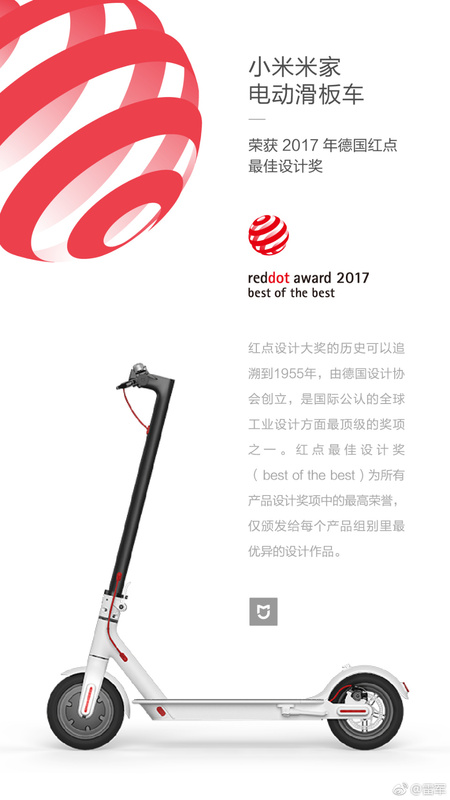 [News] Mi Electric Scooter Wins "Best of the Best" Red Dot Award 2017! Xiaomi has announced Mi Electric Scooter Dec-2016 in China. Here comes good news - Mi Electric Scooter Won "Best of the Best" Red Dot Award 2017! Various Mi Gadgets have won many International and good design awards. Thanks for your wonderfull support . Mi Smart Desk Lamp won IF Gold Award 2017 . Also Seven Mi Gadgets won IF Design Award 2017 , they are Mi Capsule Headset, Mi Drone, Mi AirWear Mask, Mi IHP Rice Cooker, Mi Band 2, Mi Robot Vacuum and Mi Electric Scooter. The Red Dot Design Award is an international product design and communication design prize awarded by the Design Zentrum Nordrhein Westfalen in Essen, Germany.There are prize categories for product design, design agencies, and design concepts. Since 1955, designers and producers can apply for the prizes with the winners being presented in an annual ceremony. Would you like to have a Mi Electric Scooter? 1. Please don't reserve posts. It just takes few seconds to write the answer. 2. Medals will be distributed to all who replies. 3. Irrelevant replies/ spams will be deleted. Plz reply to the topic only. Congratulations! This scooter beautifully designed.